The latest Tejas fighter jet has been produced in initial operational clearance configuration. 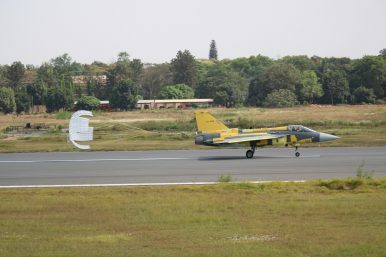 State-owned Hindustan Aeronautics Limited (HAL) has produced the 16th Tejas Light Combat Aircraft (LCA) Mark-I in initial operational clearance (IOC) configuration—the minimum set of requirements for operational deployment of the aircraft by the Indian Air Force—this month, the company said in a statement. The Indian Ministry of Defense (MoD) has placed an order for 40 Tejas LCA Mark-I aircraft from HAL, including eight tandem two-seat LCA trainer aircraft, with 20 in IOC and 20 in final operational clearance (FOC) configuration. he Tejas Mark-I was awarded FOC status by the Indian Aeronautical Development Agency (ADA) on February 20. Overall, the IAF demanded over 43 improvements and upgrades of sub-systems of the aircraft. Given the Tejas Mark-I FOC status, it appears that these deficiencies have now been addressed, although details remain murky. FOC aircraft are set to enter production this year. HAL will also set up a new assembly facility at Nashik in Maharashtra by 2020 to increase annual production from eight to 16 aircraft per year. Additionally, the IAF is expected to place an order for 83 additional Tejas LCA, including 73 single-engine Tejas LCA Mark-IA, and 10 tandem two-seat LCA trainer aircraft. The Indian MoD will issue a request for proposal (RFP) for the aircraft soon, according to Indian defense officials. However, to date, no order has been placed. Notably, two Tejas LCA are currently in Malaysia to display the aircraft’s capabilities at the Langkawi International Maritime Aerospace Expo (LIMA-2019), which kicked off earlier this week. Malaysia has issued a request for information for procuring an initial batch of 12 light fighters by 2022, with an option for 24 more in the future. India’s Tejas will be directly competing with South Korea’s FA-50 Golden Eagle and the Chinese-Pakistani JF-17 Thunder. Foreign aircraft makers are also aggressively pushing into the Indian military aircraft market and have been offering cheaper and more effective alternatives to the Tejas LCA to the IAF.